An unforgettable learning experience on snowshoes! 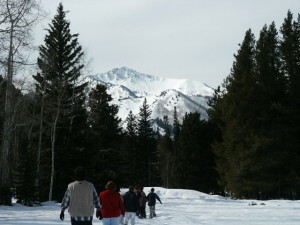 Bring your 4th or 5th grade class out for a snowshoe tour at Spruces Campground in Big Cottonwood Canyon! A powerful learning experience out of the classroom, these fieldtrips are designed for 4th and 5th grade students. We have tailored the content of these field trips to reinforce what the students are learning in the classroom. Over the last ten years, we have lead over 12,000 students on snowshoes during these learning expeditions in their mountain backyard. Led by both experienced staff and our fantastic volunteers, these programs seek to connect participants with the basic science of their watershed and the natural history of the Wasatch Mountains. Field trips are free of charge to schools. Students learn about winter wildlife adaptations, how to track animals in the snow, where their water comes from, and about Utah’s public lands. On past field trips, we’ve watched moose (from a safe distance! ), listened to coyotes, been surprised by a grouse, watched a mink swim through the water and an ermine on a hunting expedition. The snowshoes for the field trips are free of charge, generously provided by REI, who allows us free rental for the field trips. We’re grateful for their support and partnership of this program. We also have a bus scholarship program, where schools in need can apply for support in covering transportation expenses. We’re also grateful for Salt Lake City Watershed and the Uinta-Wasatch-Cache National Forest staff for their help in leading these amazing field trips. Reservations accepted beginning in mid-November. Group size limited to 60, if you have larger class please clear with us first. Email education@cottonwoodcanyons.org to make reservations.